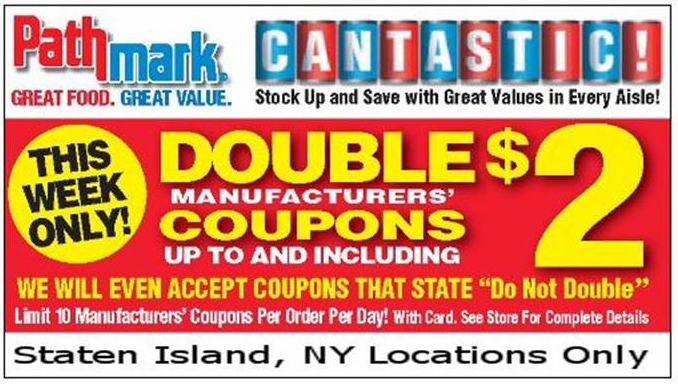 So, the rumors have been swirling all day today about a $2 double coupon event at Pathmark stores. Well, the rumors are true. However, the sale is limited to 5 Staten Island stores only. So, if you live in Staten Island, then you are one of the lucky ones. And, hey, if you have relatives or friends in Staten Island that you have been meaning to visit, well, give them a call and see if they are around this weekend. Standard Store Coupon Policies apply with the exception that Manufacturer’s coupons up to and including $2.00 in value will be doubled. 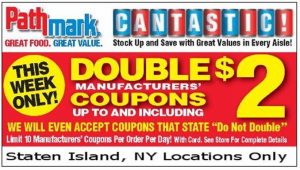 And, they are accepting and doubling “Do Not Double” coupons. Limit 10 coupons per customer per day. Make sure to check out the full Pathmark Coupon Policy.